This is one of the very first books I read on the topic. Look at other vision improvement book titles. You see words like “improvement” or “better”. How much better? Is seeing clearly without your thick glasses really possible, or will you be limited to improving your vision only a little bit? 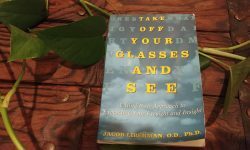 The order to “take off your glasses and see” speaks to every one of us who come upon it having lived our whole lives, or most of it, not being able to see. That’s exactly what we want to do – Take off our glasses and see, and be rid of them forever. When the order comes from an optometrist, someone deep in the world of prescribing glasses to nearly every person who walks through the door, the command is all the more powerful. With my first pass through this book years ago, I liked it, but wow, I missed a lot. That’s what happens. It was all there, but I don’t remember any of this good stuff being in it, which I’ll give you some samples of now. Open Focus is a way to look at nothing and see everything. It dissolves the normal distinction between what we think are looking for and what we think we aren’t looking for. It allows our eyes to be automatically drawn to that part of the visual field that is calling for attention at that moment. Usually it’s not what we would otherwise be focusing on. When we hold onto chronic tension, we put ourselves in a frozen state that suppresses our full spontaneity. Your visual system requires a certain processing speed, or it doesn’t work right. To work fast, it has direct the eyes to make a lot of fine movements, taking in elements such as depth and context that are required in form the best possible image. You can’t tightly regulate what you’re looking at. You can’t plan it out. The only way your vision can work right is when it is driven by your emotions, from second to second, from minute to minute. Do you avoid eye contact? Are you very conscious of what you’re looking at? Do you go for a walk, get lost in thought, and not see anything around you? Do things you see bore you, while other people (with good vision) seem more interested? These are signs that your natural interest and attention are operating below par. Your vision suffers for it. Have you noticed you see worse when you’re bored, or when you don’t want to be there? That’s also a clue. Your eyes respond to this distortion by repeatedly returning to center and eventually deciding to stay there. By encouraging us to only look straight ahead, those glasses become a highly effective feedback tool that trains the eyes to remain in one position – they literally teach us to view reality through a single fixed point of view. However, the part of our vision that look straight ahead only knows how to analyze and discriminate. The more we wear our glasses, the more we learn to judge our world rather than feel it, the more we lose our innate ability to sense its wholeness. People wearing glasses seem to have frozen eyes. Even contact lenses produce this effect, and even after laser surgery you can tell that they do not move their eyes the way that people with good vision do. The visual system only works well when the eyes are continually moving to pick up more details at varying distances and using changing peripheral vision for context. It isn’t the experience itself that leads to poor vision but our reaction to it – the coping pattern that we develop to deal with the uncomfortable feelings. When people describe a painful memory by saying, “I just couldn’t bear to see what was going on,” those are more than just words. On some level, these people literally averted their eyes from seeing. For you and I, our vision is what suffers when we handle stress badly. When I feel anxious, impatient, nervous or frustrated, it always affects my vision. I acknowledge the feeling and let it go so I can see again. Why doesn’t everyone under stress get vision problems, you ask? Well, other folks get back pain. Headaches. They develop drinking problems. Or, sometimes, they handle stress better. There is a remedy: awareness. Full awareness means that our energy field, our feelings, and all our senses are open and receptive expanding our awareness is perhaps the most important step in deeply changing our vision of how we see the world. There is really nothing else to do, because awareness itself is curative. It’s amazing what can happen when we take a little time to expand our awareness. Try simply spending some time sitting or walking, just noticing and sensing what is going on around you and within you, taking it all in piece by piece, without judging, and especially without thinking. Some people believe that if they follow their impulses, they will do evil or unhealthy things, so they try to control and judge every move. Those ideas are the result of a fear of life, a lack of trust in your own sacred being. I’ve found that full awareness spontaneously guides us to the most appropriate response to every situation. People with myopia lack a certain true spontaneity. They keep their emotions carefully in check, approving and displaying the acceptable ones and hiding the others. This is not how emotions operate in a healthy person. What you’ll see is they later release their emotions in inappropriate or exaggerated ways. Until then, they are putting on an act, and you can sense this act if you pay attention. Perhaps you do it yourself? Parts 2 and 3 of the book take you through procedures to help. In chapter 11, Being Present and Staying Current, he shows you how to examine past events that are influencing your vision now. Every person I have worked with has been able to uncover some kind of major emotional stress in the one to two-year period before their vision deteriorated. This shouldn’t be surprising. It takes something for a faculty as major as vision to get so disrupted. My vision problems started when I was a baby, but I can still identify incidences that illustrate overall patterns. The habit of sharing your feelings when they are fresh, no matter how angry, shameful, or painful they are, is probably the most important thing you can do to clear your internal and external blur. Every time we express ourselves, we lose a little more emotional clutter. It’s like taking out the garbage. If your back porch is full of trash, it may take you awhile to clear it out, but once you’ve cleaned it up, you only have to deal with one piece of litter at a time. It took me a long time to really appreciate that the way we handle our emotions severely impacts our quality of vision. I can attest to how important it is for my vision health for me to express what I’m feeling all the time and right away. I don’t always do it, and I experience the consequences. Once you have confirmed this for yourself, you’re left with interesting ramifications for situations where you think it’s inappropriate to show certain emotions. All in all, I think this is a fantastic book and I encourage you to read it to really dig into all the other stuff that he goes into that I haven’t even touched on here. 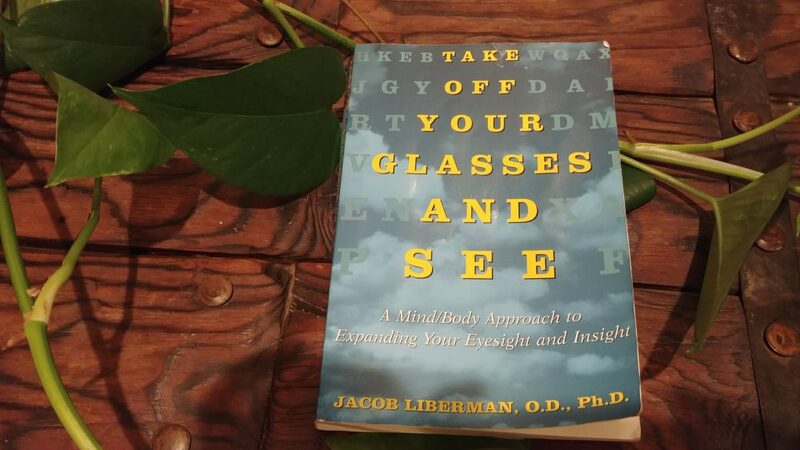 A lot of books on vision improvement approach it in a simplistic way that give you what you want in a bunch of exercises but don’t make you delve into the really uncomfortable things that are at the root of why your eyes just can’t seem to focus. We are complex beings. It’s fascinating to me that we have this sort of built-in regulatory system that blurs our vision for various reasons to carry out instructions that we didn’t know we gave, or to keep details hidden that we don’t want to acknowledge. Those blurry objects in the distance appear that way because of you. It is entirely to do with what is going on inside of us, and that will be reflected in everything that we perceive. Paying attention to details is a habit that you have to embrace fully. You can do it with what you see, but you will find yourself having trouble doing it consistently unless you also work on acknowledging inconvenient details that you would rather gloss over. I’ve written elsewhere about attention and having an interest in what you’re looking at, and how emotion is the inner force that guides it, and I think this book provides some great explanations for how you have to see the details within yourself that you have been refusing to see so that you’re able to do the same thing with your outer vision. Until then, your vision will stay blurry and you won’t understand why. I remember that a couple of years before I became extremely shortsighted I was run over by a car. I remember being very shaken up by this. I have stopped using my glasses in the last few days and feel liberated! Thank you, David! Is the pdf version available somewhere? The book is still in print, and I don’t think the author or publisher would appreciate people violating the copyright. I regret to mention this but a dozen years ago I read and studied Lieberman’s book. There is a lot of good material in it. Okay, by this time he had led many workshops on vision improvement and had private patients. I found his email and sent him a question. Could he describe 2-3 people who had studied with him, who have had such a dramatic improvement in vision as he had? Did he perhaps blog about this somewhere? Silence. Next Next post: Are You Looking In A Relaxed Way?